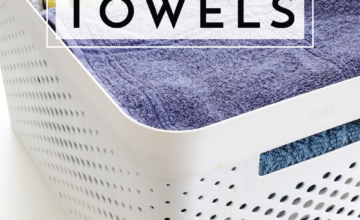 With so much recent attention and blog love for my office towers (thanks to the feature over at I Heart Organizing), I realized I never fulfilled a promise I made back in…oh…July! When I revealed these towers, I said I’d be back with a look inside, and I never followed up. Shame on me! Well, the day is here, and the time is now! 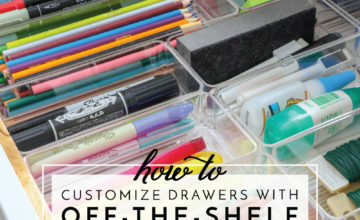 Are you ready to take a look inside all those wonderful drawers? If you missed the full reveal, you can find it HERE. 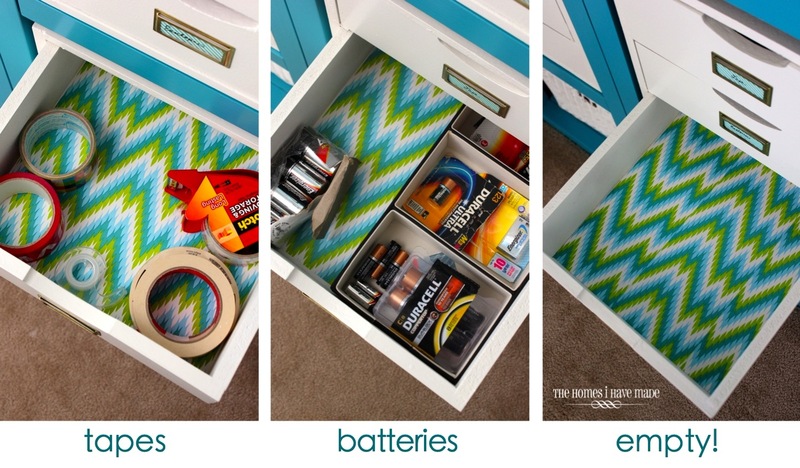 If you’ve been coming around here for a while, you know that I found these drawers at our local ReStore, and I spent many summer hours making them fresh and new and usable! They are a great size, and I was so excited to score 12 of them! Within these 12 drawers, I now have plenty of space (and then some!) 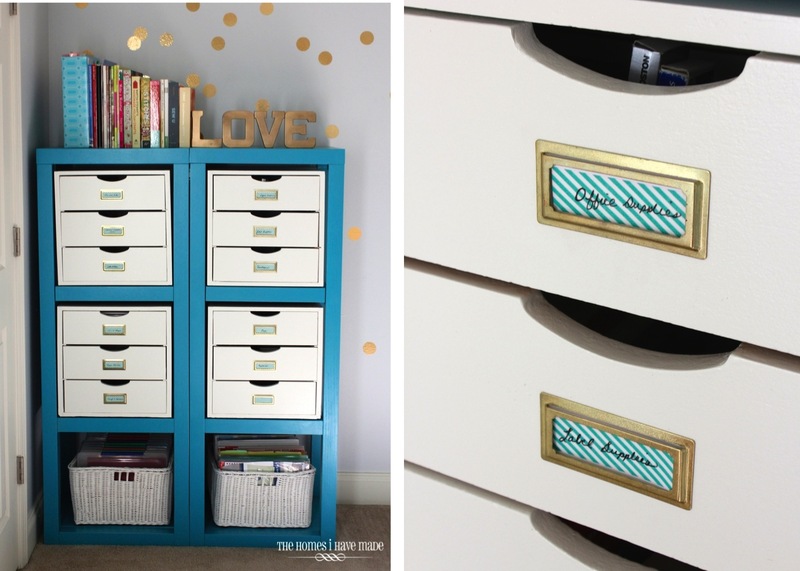 to easily sort, organize and store all of our office and (some) of our craft supplies! 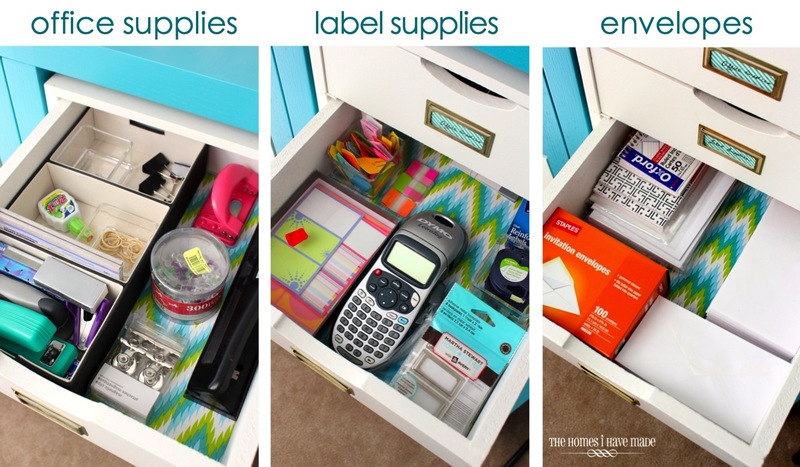 Let’s start on the right side of the tower – the 6 drawers from top to bottom hold: basic office supplies (stapler, hole punch, thumb tacks, paper clips, rubber bands, etc); labels and label-making supplies; envelops in every shape and size; various tapes; and batteries. As I was sorting and organizing everything, I was pretty excited to see I had an empty drawer. I LOVE building in space to grow in a room. That way if we get something new or more of a particular supply, we have space for it waiting! 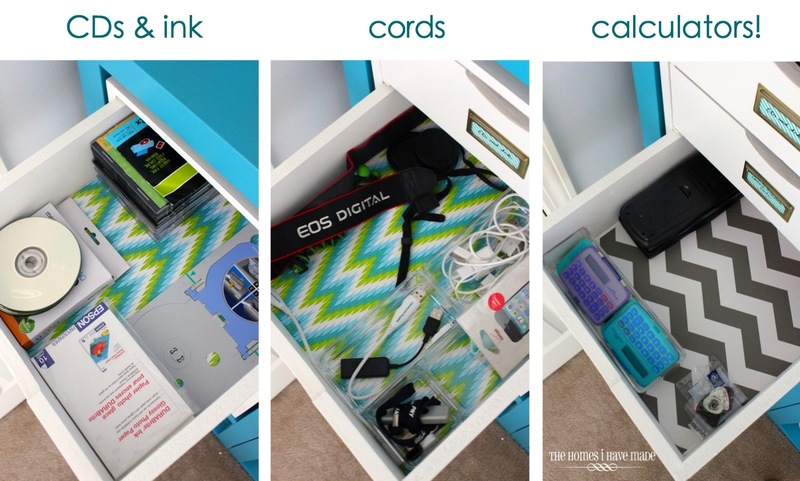 The last three drawers hold a large majority of my craft paper. The first holds 12×12 paper sorted by colors. It’s a little difficult to see, but I use 12×12 tabbed dividers (I can’t remember for the life of me where I got them!) 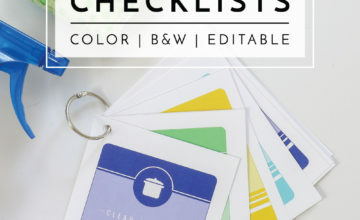 to separate out the colors. Colored washi tape help me know which tab is which! 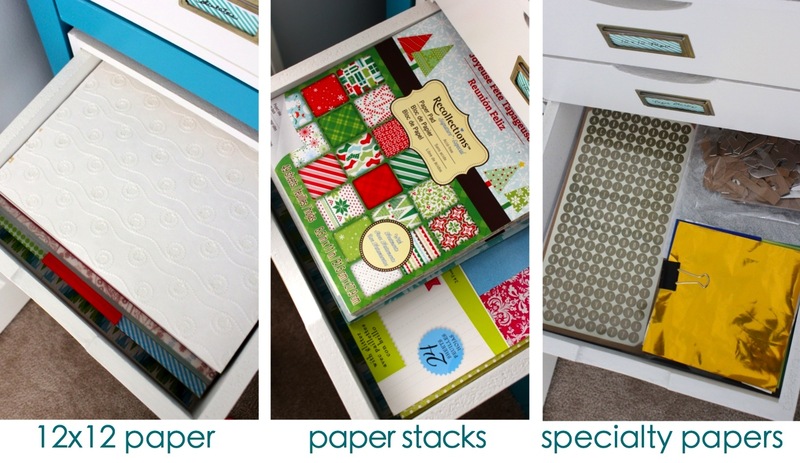 The middle drawer holds my paper pads/stacks, and the last drawer holds small cuts of vinyl, glitter paper, stickers and other specialty papers. 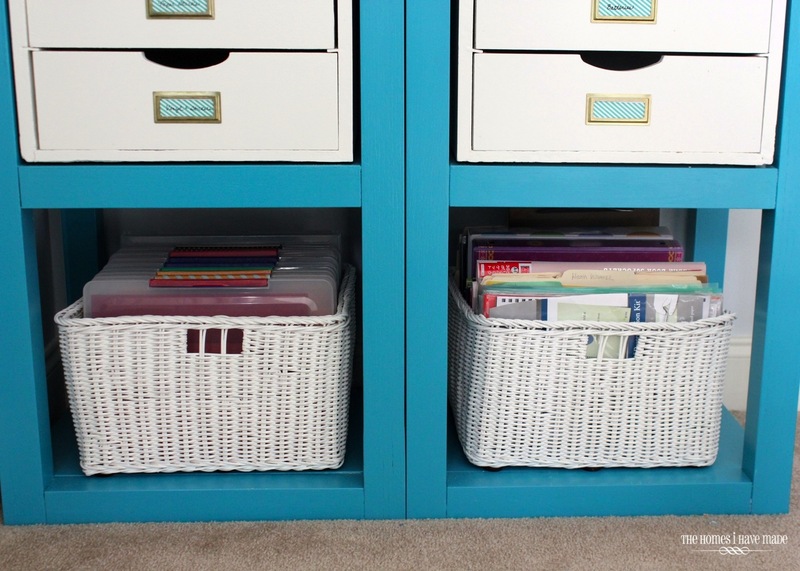 Down in the bottom of the towers, I have two really large white baskets that hold the rest of our office supplies and craft papers! These drawers belonged to a different piece of furniture we bought years ago. I was so excited to see how well the baskets fit here! 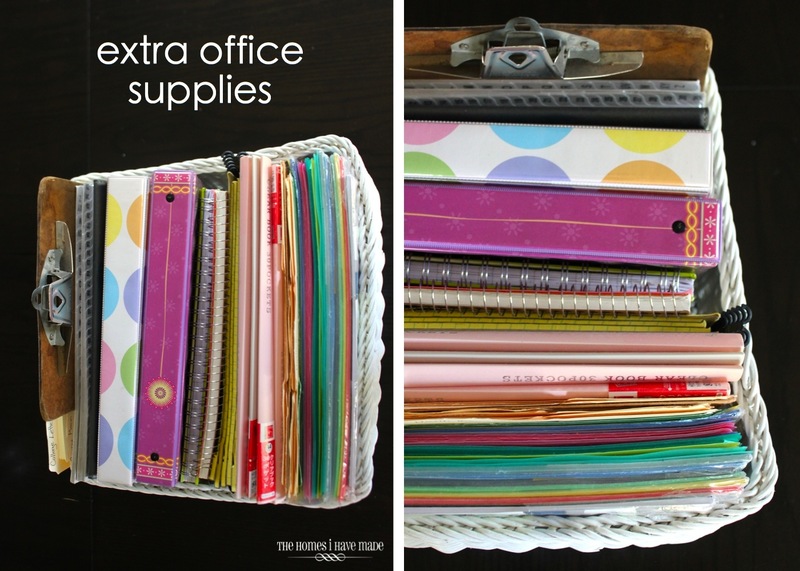 The right-hand basket holds extra binders, notebooks, file folders, yellow paper pads, etc. You know, all that stuff that you might need someday? It’s all tucked in there and waiting! The left-hand basket holds the rest of my cardstock (anything smaller than 12×12) sorted by color. I’m pretty excited to show you this part! 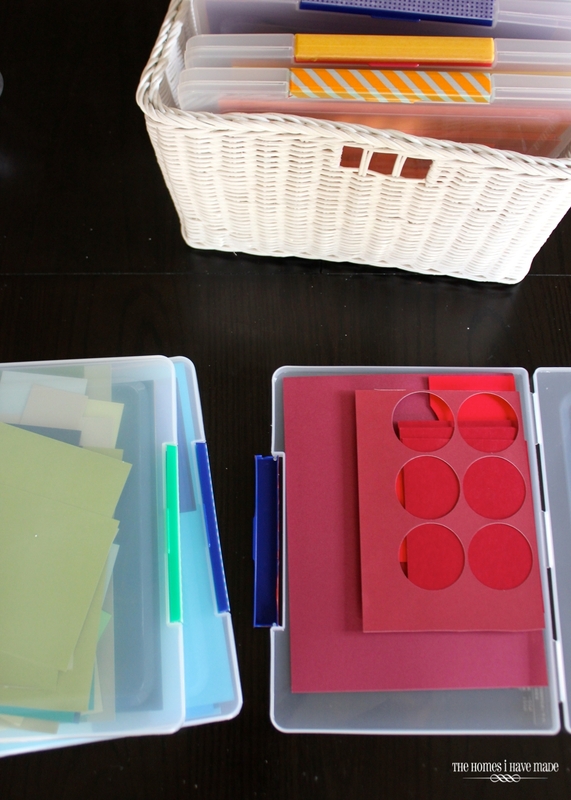 These A4 sized plastic box-type folders are another major find while living in Okinawa, Japan. I tell you, the Japanese have THE BEST organizing solutions! I had scooped up a bunch while living there and have used them for various things over the years. 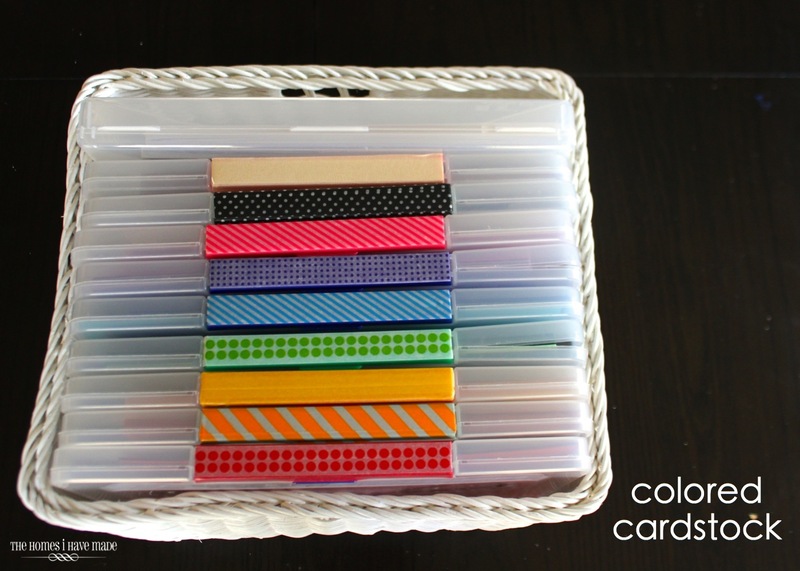 When I realized they fit in these baskets, I knew organizing my cardstock by color in these boxes was my best solution for what can easily be a paper headache. 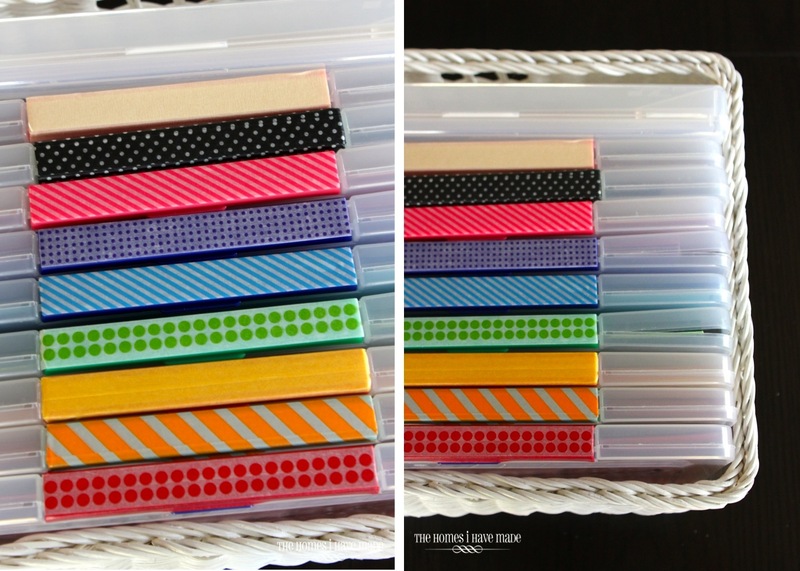 To keep the colors straight when reaching for paper in the middle of a project, I covered the plastic handles (where the boxes open) with color-coordinated washi tape. Such a simple little project but such a fun little detail! Here’s a closer look at how these boxes work. 8.5×11″ paper fits perfectly, as do smaller scraps. I love having all my “reds” in one spot and all my “greens” in another, etc. It makes finding what I’m looking for quick and easy! 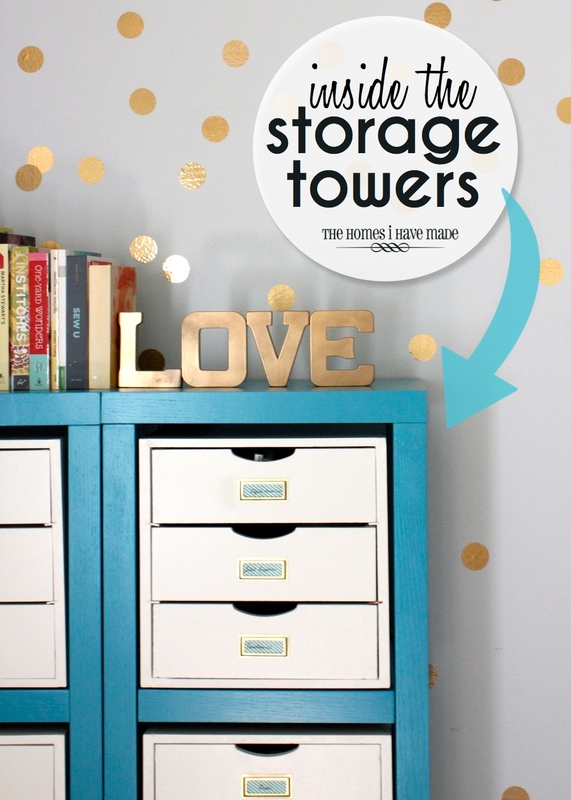 I feel like I keep saying this, but this is another storage solution in this room that is working SO WELL! Sometimes I organize things and over time, it doesn’t work. This one is a keep though, love that! Okay – I feel better now that I’ve fulfilled a promise I made almost 8 months ago! I hope you enjoyed the little tour and it was worth waiting for 😉 I know I’ve been slamming hard on posts of this room lately, and you’re probably getting tired of it. 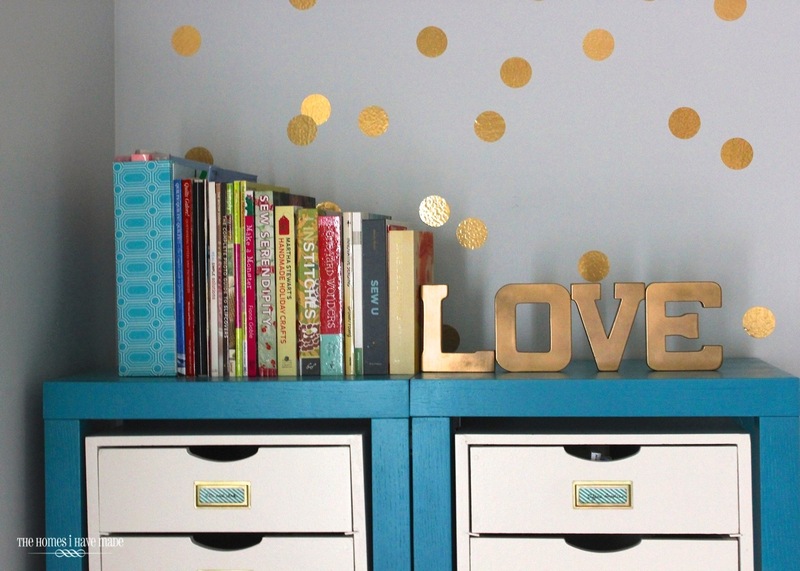 As cute as this room is, even I’m getting tired at looking at pictures of it! I’m going to change it up the rest of the week. First, a sneak peak at a new project on Wednesday and a furniture reveal (if the weather holds out!) on Friday. Hope you have a great start to your week!!!! 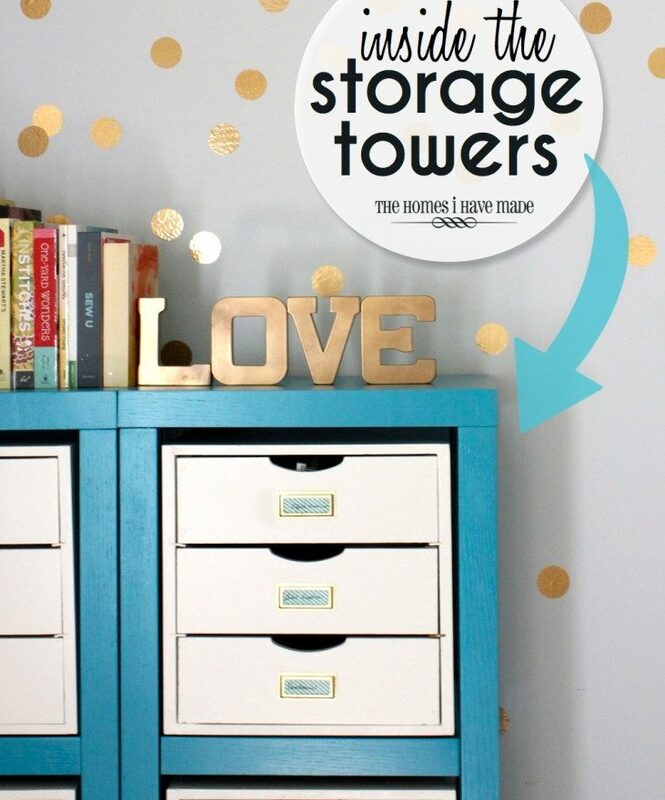 ForRent.com Feature Today - More Craft Room Love!